Tony is without doubt one of the best Triathlon/Ironman Coaches in the country. What stands Tony out from the rest is that he can really relate to the stress's I have in balancing work, life, training and racing. He does it himself and sets the standard. Unlike a lot of coaches out there, Tony is down to earth and has no ego! He genuinely cares about his athletes and tries his best to help them get the results they desire. Tony's knowledge is second to none. I know this may sound a little biased as Tony is my brother so I will rely on results as proof in the pudding. Tony has taken me in the last 14 months from a decent athlete with potential to a true medal contender in races and my first triathlon win this year. The goal however has always been a solid Ironman performance and at Ironman Austria 2016 and thats exactly what I got producing a massive PB in 9hr 32min. I believe he’s got to be one of the best long distance triathlon coaches in the game. I have only been with Tony since Feb 2016 of which I have been injured for the majority of this time. Tony was already taking on a nightmare in me, (let alone an injured me) as I am a trainaholic, I did 30+ week and was pretty nervous about letting someone else take control over my training. One of our first meetings, he asked me what I really didn’t want to give up. My swimming, I love swimming and have often been told I need I need to cut down, but Tony seemed to understand and has let me keep the swimming in. I will admit I contacted Tony pretty often to see if I could alter my programme and add more sessions in, here and there, but what I started to realise was the intensity of Tony’s sessions, were often much harder than what I had been doing on the bike and run. So I started to look forward to the programme. I am a person, who needs to know if I’m doing things right and I can guarantee there has not been a single week, where I haven’t contacted him for something, and he will always find time for me. I had to make a tough decision to transfer my IM race from Bolton to Weymouth, due to injury and again Tony took time out of his busy schedule to sit down and have a chat and a coffee with meand help me make the right decision. I’m looking forward to getting back up and running and I’m sure I will be challenging yet again, wanting to run, before I can walk, but I trust Tony to guide me in the right way to prevent further injury and get me to that start line. Tony deserves a medal taking on an athlete like me…..Challenging, Questions everything, wants to train more and more….but he never makes me feel I can’t be who I am…..but I am dedicated! And lastly he is a coach who I trust, will get the most out of me. Tony has completely transformed the way I train for the better, I used to do so many wasted miles in the pool, running and biking with none focussed sessions and when training for Ironman all those wasted miles can equal lots and lots of hours of your time! Each session I do now has a real focus and target and are well laid out and easy to follow and I know I'm not doing any more wasted miles that won't help me improve. Having Tony set my training out means I no longer really have to think about things, I know what I need to do each day a week or 2 in advance which means I manage my time between training, work and family time so much better. of being coached by Tony. Having known Tony for a long time when i first started running at Bury Athleticsi have always found him very approachable, about 4 years ago i started doing triathlons and would speak to Tony every now and again asking for bits of advice which he would help me with, I then progressed to half iron distances and would ask him for tips and advice as it was a big jump up to the half distance. Last year i entered Bolton Iron Man 2015 and found that i was asking Tony for a lot more help and advice which he would talk to me about by seeing him at the local running track or by text or Facebook i finished the Iron Man in 15hrs 49 mins. is well structured and is fairly easy to understand if i wasn't sure i would email Tony and he would get back to me and explain it , now with 6 weeks to go to Bolton Iron Man 2016 I am a lot fitter and have got better endurance which i have achieved through the plan off Tony , nice one Tony Cullen. I've only been with Tony since the beginning of this year and with his help I've been the fittest I've ever been. I like how in depth the training sessions are and for me that keeps the training interesting. Tony's support and advice are second to none. He has really helped me not just with training but also with what's best to buy and also nutritional advice. With his guidance I knocked almost an hour off my outlaw half time that I did last year. If you want results then get in touch with Tony. I've only known of Tony over the past 3 years and seen him at various events and liked how he goes about himself, always easy to approach and always there for a few words of advise and encouragement even when he fly’s past you ha ha. This and his hard earned knowledge of triathlon led me to get in touch with him regards advise and ultimately his coaching package. I had so many questions, does and don’t that had bugged me over my training especially with the frustrating winter months am I doing too much to little, then moving into season how to prepare, especially for the long distance, all this was answered by joining him, I also feel that I have reached another level of fitness through his coaching, and I have direction and focus, and don't go mad doing every event on the calendar, and in a short period of time I have learnt so much, and no if I am ever need him he is there in your corner to answer and advise, can' wait to get cracking with ironman, and also to represent his / our :) tri club, here's to the future !! Well where to start. Since i joined Tony in March 2016 my journey has develop very quickly. The service Tony offers at TriCentralUK is second to none. First of all the training plan is extremely beneficial as he creates all the sets for you this is not only good in terms of not having to create your own sets but it also makes the training a lot more interesting especially when on the turbo. Also Tony is superb when it comes to contact he will reply to emails, texts and phone calls as soon as he possibly can which is excellent in my eyes. Finally, the advice I have been given by Tony is absolutely superb, he really knows what he is talking about. He is a triathlete himself so uses all his experiences to help his athletes be the best they can. I would 100% recommend tricentral UK to anyone looking to improve their triathlon performances or looking to partake in the sport. The service is immense and you learn so much and it isn't very expensive either, if your thinking about it go for it, it will be a decision you will not regret. the communication has been first class. Tony has installed the importance of recovery and quality over quantity. my time better. I come from a strong cycling background so getting the correct balance betweenthe 3 disciplines was essential. Tony has helped me hugely with this and my cycling is as strong as ever and my running the best it’s been. Tony Cullen has been my coach for over 3 years. He himself will tell you I haven't been the easiest person, in fact a huge pain, but the fact he has show dedication, commitment, understanding and a lot of patience with me. With his hard work, training plans and unbelievable advice I have gone on to achieve so much in a short time in triathlon. When racing and my body was hurting and my head was telling me to give up his advise and words of encouragement would always push me through. He is not only a coach, mentor but also a friend. I got my 1st age group win at my toughest over distance half ironman, my fastest half ironman and Olympic distance. I know there is so much more in me to achieve and with Tony Cullen's guidance I will go from strength to strength. I was a self coached athlete that had made steady progress and then come to a plateau in my progress. I had looked at training plans etc and although they may have helped I didn't know how to really test progress to keep a check on improvement. I got in contact with Tony who patiently and clearly explained how to do things right. Every question I had he was able to break down and simply explain to me the correct approach. It is clear that Tony knows how to train with his own personal race results actual proof. On top of this he also a great communicator and always has time for his clients. My name Matt and I have known Tony for many years. I have watched from afar his progress as a triathlete and have always admired his commitment to the sport and what he has achieved. After working in the fitness industry myself I really needed a training goal. When one of clients approached me about doing a triathlon with him I jumped at the chance. Not knowing anything about triathlon I contacted Tony for some help and advice and where to start. I couldn't swim and I didn't have a bike. I jumped on board there and then as a client and got started training straight away. My first race was only 3 months away. Tony's help and guidance was so important to me even making the start line. I completed the race (which was a sprint distance) in 1 hour 13 minutes and finished 50th overall. Almost 10 minutes ahead of my friend. That was it I was hooked. Now 18 months later I have just competed in the same race and finished in 18th place overall and 5th in my age. I'm now moving through the distances and competing in my first middle distance race next month. I simply couldn't have got to where I am on this journey without the help, guidance and support of Tony as my coach. After spending 3 years of training on my own I decided to ask Tony if he could help out with my triathlon traIning plan. I've noticed within a short space of time what a difference he has made in terms of quality and structure to my training, this has freed up time allowing me to spend more quality time with the family but most of all enjoying training again as each session is different. So glad I approached Tony I just wished I'd done it a lot sooner. I have been racing triathlon since 2012 and have found that Olympic and half Ironman are my favourite distance to race…enough to take the sprint away but not enough to race all day! My favourite race to date was Bala middle distance in 2013 (even though the run destroyed me!! ), it was a tough but fantastic race that I would definitely do again. I met Tony through triathlon who introduced me to TTT which led to him coaching me. I joined in January 2014 and haven’t look back. I like the structured training around target races and it means that I don’t overtrain. I guess I’m lucky in that I don’t have a preference of discipline, I like (or hate depending what day you ask me and what session I have just done!) all three but you can’t beat a great ride out on a hot summers day on the bike. I don’t have time for anything else outside of work and family. 17 & 18 stone in weight and I decided things needed to change when it was a struggle to put my socks on. So I cut out the junk food and started walking and swimming before work (breast stroke only), I always enjoyed cycling when I was younger so I decided to add cycling into my new regime. As the weight continued to drop off a friend of mine suggested I joined a local running club where he was a member of, this was about the time of the London Olympics where I saw triathlon on the tv for the first time. 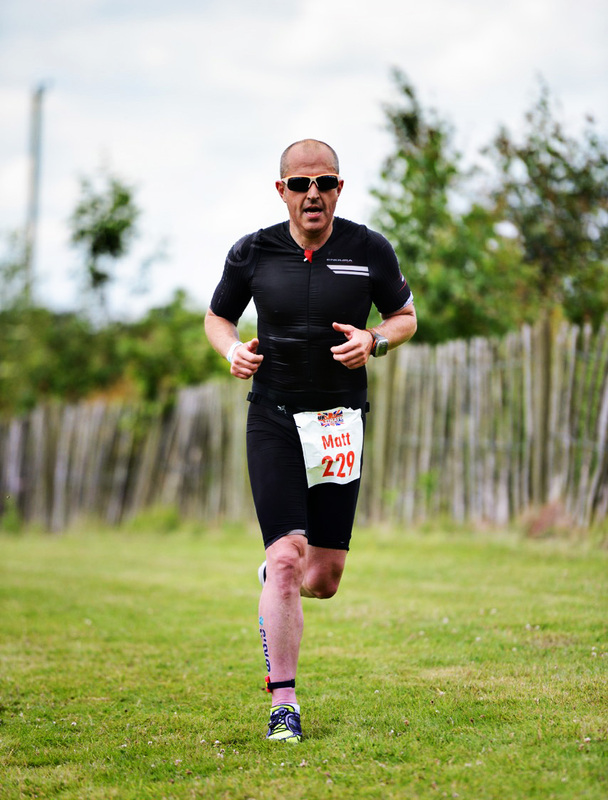 I realised I was doing all three disciplines and decided I was going to enter my first tri (Hereford Sprint 2013) and I have not looked back since! So far I have completed sprint up to half ironman distance triathlons having done Majorca and UK 70.3 in 2014. I am currently training towards my first full Ironman in 2015. My favourite discipline is the cycling but I am learning to love all three. My triathlon achievement to date was coming third overall at Shrewsbury Sprint triathlon in 2013. Outside of triathlon my hobbies include coffee and cake! I also enjoy clay pigeon shooting and have a passion for motorbikes. However the more I get into triathlon the more it takes over my life! I have also gained my level one coaching qualification through my tri club SYTri. TTT was recommended to me by Phil Murphy who I first met at Shrewsbury Triathlon Club and I joined the team under the coaching of Tony­ in June 2014. Being new to the sport it has been a real advantage being coached by someone who has been there and done it, I didn’t want to waste time learning through trial and error myself. I know that each session I do counts and that Tony’s experience and success in the sport will only take me forward in the direction I want to go. Back in the summer I saw on Tony Cullen’s terrific achievement at IMUK posted on Facebook and having started taking triathlon more seriously around the same time together back in 2009 I wanted to find out how he went about it only to discover he had entered the world of coaching. Perfect I thought as I was in the process of identifying a coach to help with my Dubai 70.3 and IMWA 2014 training plans and preparations. After being ill in hospital I set my mind on becoming an Ironman triathlete, after a few months of cycling, I decide to tackle the other two disciplines. After struggling with injuries running a friend of mine introduced me too Tony, we met for a coffee and spoke about my aspirations and how much time I could dedicate to training, as it turned he also suffered with the similar injuries over the years and gave me promise we could work through it, within a few weeks I was amazed to be running injury free. Being coached by Tony not only takes out the thinking process and compilations of juggling three disciplines, you also get access to myriad of tips and advice that he has learned the hard way over the years of racing an elite level, wether that be kit recommendations, race nutrition, bike set ups and injury prevention. Tony has a flexible approach to coaching and is always in hand to offer help and guidance through every step of the journey. Triathlon has changed my life and has put me on life changing journey of self discovery to which I will can't thank Tony enough for helping me, he's not a just coach but a friend. I've only been with Tony a Short time, but already feeling the benefits. He always is willing to Work with you and understands you have a life outside of triathlon. He is also quite willing to Swop sessions around as and when required due to work commitments and maybe even tiredness. Tony is always willing to chat and discuss training and performance and Gives encouragement when needed especially after a bad race. I'm Looking forward to a full years training with him. The Ironman motto is anything is possible, Tony Cullen makes it happen. I met Tony on my first sprint tri and noticed he won! After that I thought he could be the guy to improve my tri experience. We met and I was bowled over by his enthusiasm and plans for a novice and a very mature one at that! The first season went well and in the new year Tony contacted me asking what I wanted to achieve for the new season. We chatted and he came back with a plan. It was tough, with Tony you get out what you put in but the rewards are worth it. We have gone on and progressed to this years Ironman UK. I never set out to do IM but the progression with Tony is amazing every step up is seamless, and what you thought impossible becomes attainable. Since the start everything Tony has planned has come to fruition,some of the goals set seemed excessive but Tony gets to know his clients and if you put the work in you will reap the rewards. I know Tony has a large number of elite and AG triathletes but has always been available with any queries I have and he is constantly commenting on workouts and adjusting the workouts if he feels you are ahead of the plan. I would never have achieved what I have done without Tony’s coaching. There is still lots to do this year so when Tony rings next year what’s the new Challenge. After watching and supporting a good friend doing IMUk Bolton 2017 I was inspired and interested in doing a triathlon myself. I met Tony towards the end of 2017 at my gym, he was so positive full of passion and energy about his sport. I feel I have achieved so much. His consistency with advice & support throughout has been encouraging. The training plan has been great for me, enabling me to balance my own business and being a single mum with 3 children (24/7) with all the training. The training has helped me improve my swimming and running both technique and times. The bike, I only purchased a road bike last November (I’d never rode a road bike before) my biggest challenge but I’m understanding more and learning all the time with the help of Tony. Tony has given me the whole package from training plans, advise throughout training before and after events, nutrition advice, race prep, transitions, any questions Tony always there with great advice and support. Doing my first ever sprint triathlon in April and then a 70.3 Marbella at the end of April in the lead up to IMUk Bolton 2018 which I completed in 12 hrs 8 mins. I feel Tony has helped me achieve beyond my goals this year, I feel I have hit another level of fitness. Tony’s knowledge as a triathlete himself is outstanding and I look forward to continue training and my journey with Tony. I have been coached by Tony for 12 months now, having decided to train with him following a very disappointing performance at Staffordshire 70:3. Prior to this I had completed Ironman UK in a reasonable time and had some decent performances from sprint distance through to half distance. Prior to commencement, I had met with Tony and had a long discussion with him regarding my goals and objectives for the following year. He explained carefully how he would structure my training to complement my work schedule and how the sessions he sets would ensure I peaked for events at the right time. The sessions that Tony set me were very varied and helped keep me motivated. There are some tough sessions amongst these, that push you and make you dig deep, but his encouragement and patience through some of the more testing ones helped push me along. It’s imperative that you do your own part in this by being consistent and true to your training schedule and very quickly you start to see the benefits of Tony’s methods. Alongside, the training plan, I got so much valuable advice from Tony in regards to my nutrition, race planning and tweaks to my bike set-up that helped enormously throughout the year. He was always available for a chat and we had regular meet-ups to discuss progress, race selection and any changes that we wanted to try. Communication back on sessions was always supportive as was his ability to know when to push you harder, or ease back with some low stress sessions should fatigue begin to set in. What is important is the impact that being coached by Tony had on my results. I was the fittest that I have ever been and also more confident in executing a race strategy. I set a personal best in every event that I competed in during 2018. Despite ‘Ironman Austria’ being my goal race and the training being tailored for this event, I still beat my Sprint Distance PB by 3 minutes, my Olympic Distance time by 14 minutes, my 70:3 time by 26 minutes and finally my full distance time in my ‘goal race’ by nearly 2 hours, achieving a time of 11:19:26, well inside my initial desired race time from my first discussion with TC! I peaked perfectly for all of these events, running 5K and 10K PB’s off the back of the bike legs also for added measure! I have no hesitation in endorsing and recommending Tony as a coach, the results from all his coached athletes, not just myself are testament to this. I believe that if you choose to use Tony, then you will achieve your goals and enjoy the racing experience that doing this brings. I will continue to have Tony as my coach in 2019 as I firmly believe he can still get more out of me and that by working together we will improve my performance even further.